17 years of clan matches, rambling conversations and… weddings. In 2001 I played the demo of Operation Flashpoint for the first time, courtesy of PC Gamer’s cover disc. A month later, after the release of the full game, I found myself in love with its multiplayer and at the start of an intriguing journey that I’ve been on ever since. In prehistoric times, hosting a multiplayer mission in GameSpy with a 56K modem was like trying to race a camel whilst tied to a bungee rope. In 2001 Operation Flashpoint’s map editor was exceptional but, given my 56K connection, the only way I could play my homemade missions publicly was if I sent the files to people with better connections so they could host them. That was how our clan really began, and a year or so later we’d rented our own public server and begun using TeamSpeak 2. ‘Striker, are you there?’ a muffled voice called out through my tinny Logitech speakers. I hated answering phones, and the first time I used TS2 I was filled with dread. Despite that, everyone was lovely and I soon realised I’d struck up some meaningful friendships. One person came to visit me in Newcastle, another invited me up to a wedding in Fort William and showered me with haggis. In the years that followed, we played dozens of clan matches and enjoyed countless sweaty-palm moments. Never without the odd forum drama or ‘hackusation’, most of us stuck together and clung onto Operation Flashpoint as the community slowly drifted. Then in 2006, the very sad passing of one our members was a catalyst for our big meet-up in Manchester, with some travelling in from as far as Germany. One of the guys from Sunderland picked me up and we drove down through Lake District snowdrifts. Two fun days of solid drinking and wobbly English ensued. In the months that followed the OFP community flaked away, and we found a new home in Battlefield 2. Once we managed to somehow recognise and find one another in Manchester, we raised a pint to our fallen buddy. Fast forward to today and the landscape of PC gaming online has changed so much—or at least it has for our clan. At one time members of the team might bring a friend, a workmate or even a family member along to join up, but these days the opposite is true. Many of our number have disappeared in favour of playing with real-world pals. Members still hook up, but they dip in and out of their own rooms on Discord, using it as a place to natter as much as play games. Neatly archived forum discussions are long gone, too, given up initially for a huge communal Facebook chat, and now replaced by a stream of conscious diarrhoea on Discord, plus the sharing of dog gifs. Once-coherent conversations have been drowned out in our own sea of emojis and memes. There are other Battlefield clans parallel to ours whose servers we’ve played on over the years, and it seems they share this trajectory. It’s been particularly noticeable for all of us since Battlefield 1, which didn’t offer clan tags or Platoon systems until months after release. Tags help to advertise the clan, and without them it’s almost impossible to recruit. GameSpy and Operation Flashpoint are where it all started. The wide-open spaces and isolation of Flashpoint’s islands are still present in PUBG today. 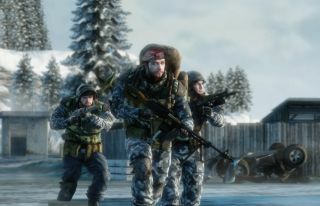 For me, more worrying still is the multiplayer model that popular games such as PUBG have adopted, where, instead of browsing for a dedicated server, you hop in and out of matches, temporarily connecting with other players via matchmaking. Dedicated clan servers have always supported the longevity of their games, acting not just as platforms for the teams who rent them, but as hubs for the community. In spite of this, we’ve gone back to Battlefield 4, and occasionally still manage to reignite the old clan romance across its dwindling servers. Time is scarce these days, with most of us now past 30 or 40 years old. The intensity of all-night gaming marathons has been replaced by late-night baby feeds, punctuated by two-hourly bottom wipes and burping. Who knows, maybe life has just taken over. But, delightfully, two of our Dutch chaps flew in from Amsterdam for my wedding in 2015, which is testament to what lasting friendships we’ve made. As if that wasn’t enough, they came fully armed with two pairs of customised clogs for myself and my wife. 17 years on, my feet may now be splintered, but I know it’s all been worthwhile.